I know it’s Stat Boost day, but I’ve been working on this entry for the One Page Dungeon Contest and now that it’s finally done I wanted to share it. So, no Stat Boost article, but you get a bonus mini-adventure. The nature of the contest means that everything has to be system neutral – so you won’t find any stat blocks or references to any official WoTC (or any other RPG) material. You should still be able tp run this adventure with a minimum of effort, though – and I’ve included high-res, 1-inch scale maps for your convenience, too. I’d love to know what you think of this, and whether you’d like to see more of this kind of thing in future. “I saw a dragon in the flesh, once. Many, many years ago, that, long before you or anyone you know was born. It was huge, a monster, a nightmare made flesh – but it was nothing compared to those bones. As you might have noticed with the Tarnswood map I posted last week, I’ve been trying out different styles. This one was heavily inspired by the work of Mr Stephen Joy, who I’m a big fan of. 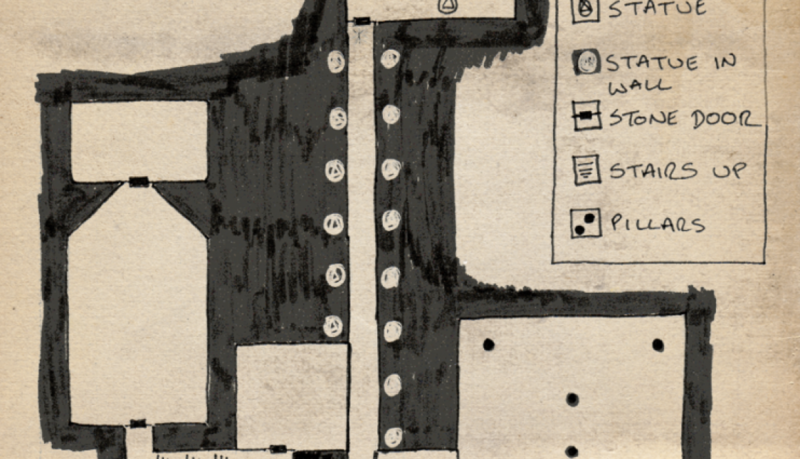 I’m happy with this map, but it’s nowhere near as good as his work, and you should definitely go check him out and consider becoming one of his Patrons. I had an issue exporting this map at full size – it’s simply too big for my PC to handle. The largest I could get it to was 6228 x 3980 px, which is 36% of the original size. So, no to-scale 1 inch grid today, unfortunately, but you’re still welcome to the larger map if you’d like it. The Coldstone Caverns honeycomb the cliffs to the far south-east of the continent, in one of the coldest regions known. They were carved over thousands of years by the slow grind of nature, and have been home to many creatures over the years. Though they are warmer than the harsh omni-blizzard outside, they are still mostly frozen over. Those who have set foot here and managed to return to civilization tell tales of hauntingly beautiful structures of ice, caverns filled with delicate glassy spires, roofs of diamond-like clusters of ice crystals, and strange creatures frozen into serene statues. At some point a strange sea god was worshipped here. Its statue stands in the entrance chamber, a writhing mass of slick tentacles and large, piercing eyes. Another shrine stands beside the never-freezing salt lake in the south-west portion of the caverns, in a chamber accessible only by traversing a narrow, frozen tunnel high up in the wall. Feel free to use these map in your games. If you would like to discuss using them for commercial purposes, please get in touch with me via the About page. This isn’t my best-looking map by any stretch of the imagination. I struggled to find a way to shade it while making it obvious that the dungeon is situated underwater, and I had to fall back on some free vectors of the lighthouse and rocks that form the surface because I completely forgot to draw them in. At some point in the (probably near) future I’ll go back and draw this up with a bit more polish (including fixing the wonky dome at the bottom). Disclaimers aside, it’s probably fairly obvious that this map takes a large chunk of inspiration from the Bioshock series and Sealab 2020. I doubt it’s ever something I’ll get to run my players through, but it was fun to design and once I’ve populated it I may write it up as a free standalone adventure. The elevator descends on chains from the lighthouse above through a clear tube that allows a perfect view of the darkening ocean surrounding it and the glowing lights of the complex far below. 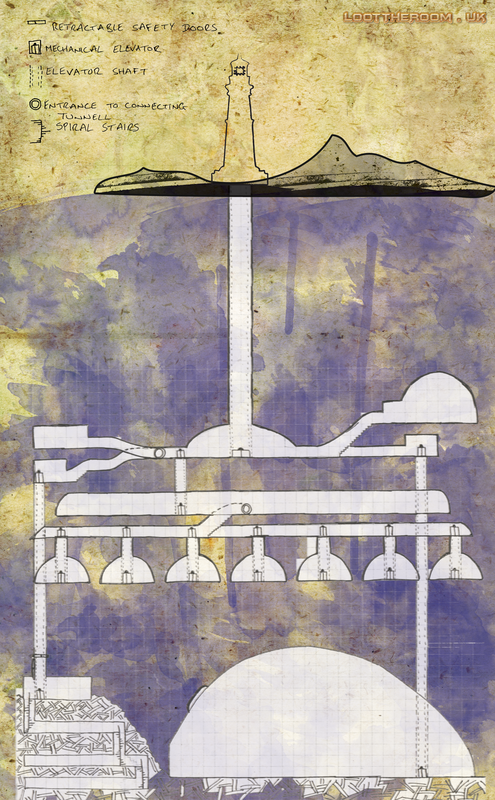 The elevator opens up into a large atrium with more tubes that branch off into the sea, containing walkways that lead further in to the base. The Overseer Lives in the domed chamber at the top of the base, with a direct passage to the atrium that is guarded at all times. The chamber below his contains a private elevator that leads directly to the hangar dome on the seabed. The westernmost passage from the atrium leads up to the guards’ room and down to a elevator used to transport captives and criminals down to the dungeon built in the to floor of the ocean. This elevator shaft contains huge sliding steel doors above an airlock door of sorts that opens directly in to the ocean. In the event of an attack on the base or an uprising in the dungeon the steel doors slam shut and the airlock opens, allowing the water to rush in to the base and flood the dungeon below. The bottom floor of the main complex leads to individual labs and research centres that are suspended from the complex in a circle that expands out beyond the dungeon and hangar below. Each of these research centres can be jettisoned from the complex in the event of an emergency, when they will fall to the seabed below. The large domed structure on the base of the ocean is the hanger, which contains the Overseers fleet of aquatic vehicles and the bulk of his weapons cache. I’m a little torn when it comes to populating this map, truth be told. It obviously lends itself well to a scifi setting, and could definitely be made to work in a more Jules Verne-ian steampunk-feeling world. My group play in a traditional (ish) fantasy setting, though, and I’m really curious to see what I can do to this base to make it work in that kind of world without feeling anachronistic. That’s for a future post, though – along with a better quality map. The Hall of Whispering Gods serves as the last test for initiates wishing to gain access to the mysteries of the Ancients. The long, narrow corridor is lined with statues of the Ancients embedded in the stone of the walls themselves. Each statue whispers unholy secrets to those who pass, testing their will and their sanity and leaving them either dead or wise beyond belief. Their long walk is observed by Elders and tutors from the balcony rooms set to either side of the hallway. Their discussions are not for the ears of the initiates, but their judgement will be cast down in the ritual chamber that lies at the end of the walk. There initiates will either be welcomed in to the fold, or else sacrificed to the Ancients to atone for their unworthiness. The Hall of Whispering Gods was a quick freehand sketch, hence it not quite lining up to the grid. 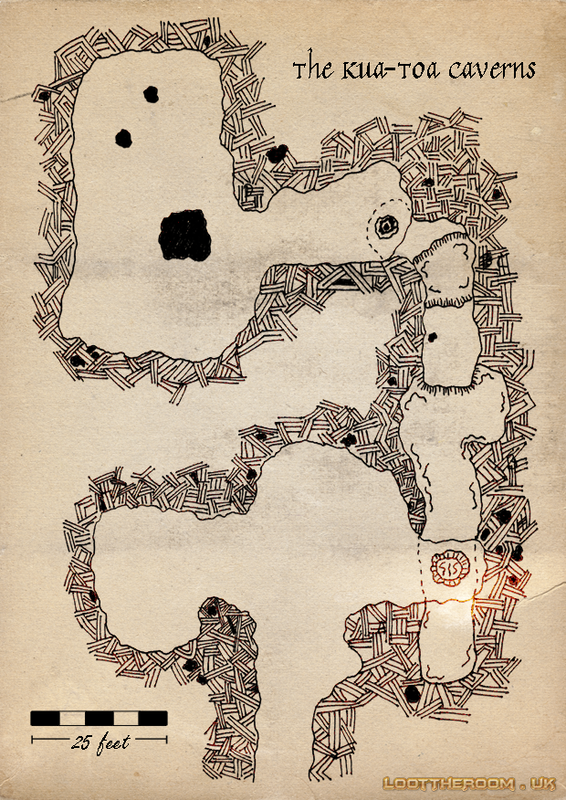 I also tried a different approach to shading the borders – I’m aware that my maps look a little too much like cheap knockoffs of Dyson’s fantastic creations, and I’m trying to find my own style. This isn’t it. If you use this map, please do let me know! 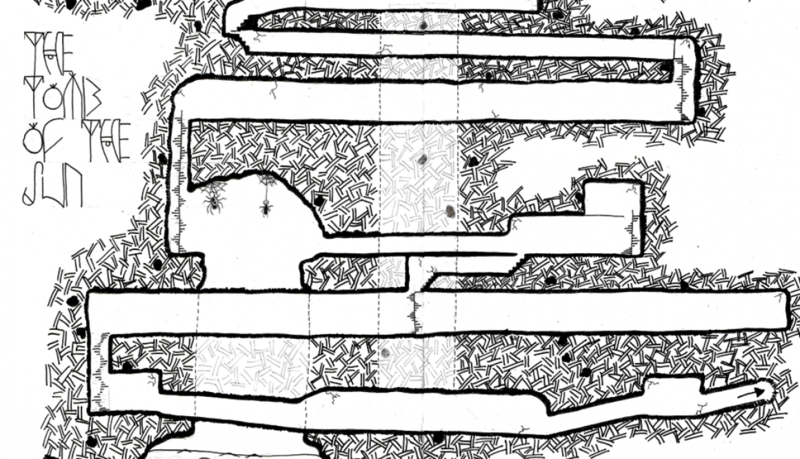 Not a gaming map this time, but a side elevation of the buried tomb that serves as the location for the novel I’m currently writing. An ancient pyramid that served as the final resting place of the Sun God, the Tomb of the Sun was buried by the sands of the desert centuries ago. The God’s riches and weapons are encased within the rooms of the pyramid, protected by magical traps and guardians that the Sun must traverse in his death in order to return to life. The bottom chamber is a large, ornately decorated room that stores offerings made to the Sun on his entombment along with his physical body. Upon his resurrection his body will return to life and begin its journey through the tests of the pyramid before regaining his Soul Jar in the Chamber of the Gods. The rooms on either side of the Sun’s Tomb chamber contain more riches and offerings, as well as the bodies of those sacrificed to serve the Sun in his death. The elevator that bears up the altar bearing the Sun Jar is inaccessible from this room when raised, though the shaft is visible as it opens directly in to the roof of this chamber. This floor is dedicated entirely to an enormous Labyrinth that the Sun must traverse, seeking the stairs at the centre that will take him to the next level. The ‘centre’ of the maze is not in the centre of the floor, as the shaft bearing the elevator rises through this room. It is walled off entirely. 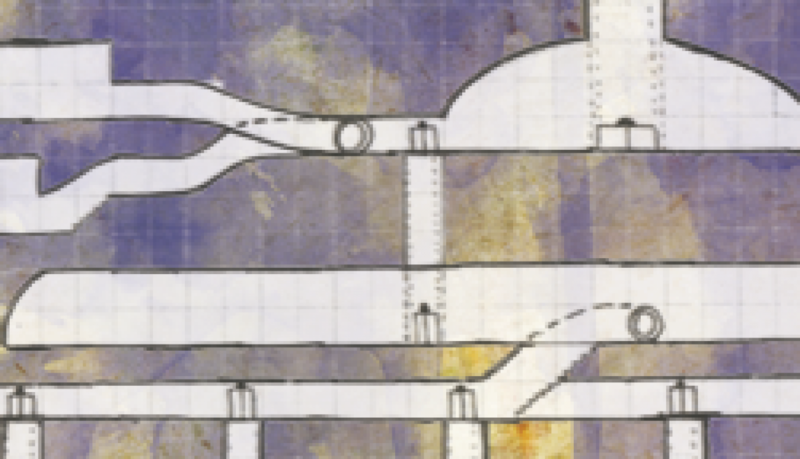 There is another walled-off section that contains the shaft below the Clockwork Web. A giant banquet hall that contains a large table decked out with a feast fit for the gods. The food is magically preserved but contains a poison deadly to mortals. This serves both as the first meal for the newly risen god and, more practically, a trap for unwary thieves. The King’s Chamber sits directly above the banquet hall, and contains the haptic jars belonging to the dead god. He will need the contents of these jars to complete his body before he can retake his Soul Jar. To the east of the banquet hall lies a large cavern carved in to the structure of the pyramid. A large shaft falls away to a naturally-occurring lake beneath the pyramid. To cross the cavern the god must traverse a giant web constructed of fine chains, and fend off the spider-like clockwork guardians that lurk above it. The final challenge room of the pyramid, this chamber contains the petrified remains of the god’s menagerie. Magical beasts of all kinds are entombed here – manticora, wyverns, giant scorpions, and the like – and will wake if any light touches them. A simple shrine in which the Sun must purify himself before regaining his soul. The walls of the pyramid are filled with pipes filled with water and oil. 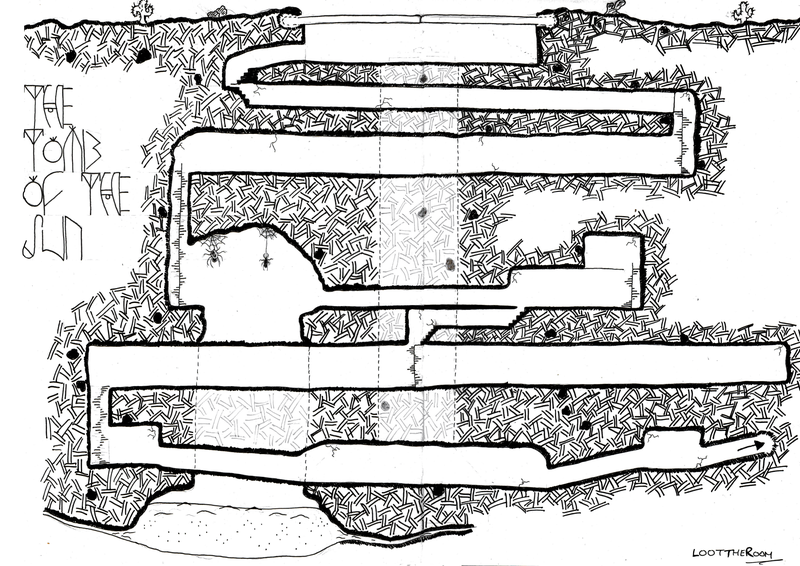 A feature not shown on this map is the extensive mechanism that also runs through the outer walls that utilises the energy of the underground river to circulate lubricating oil to the various clockwork devices throughout the pyramid, including the intricate locking system that seals the roof/doors. At some point I’ll have to draw a more useful top-down map of the pyramid. Before I do that though I should probably finish writing the damn novel. This week I found myself having to run a game two nights in a row. We’ve only just begun our campaign, and one player couldn’t make it to the first session. She also didn’t have a character yet, and had never played the game before, so I thought it best to get her over for a semi-solo mission (my girlfriend, who is also in the group, agreed to play a one-off character to accompany the new player on her first quest) in order to go through character development, teach her how to play, and get her levelled up. It also had the added bonus of allowing me to develop some more of the world (both based on what happened in the game and the character she ended up creating) and to thread some plot elements in to the ongoing campaign that will be introduced naturally by another player, not through me in the shape of an NPC or a fudged Insight check that leads to inappropriate exposition. 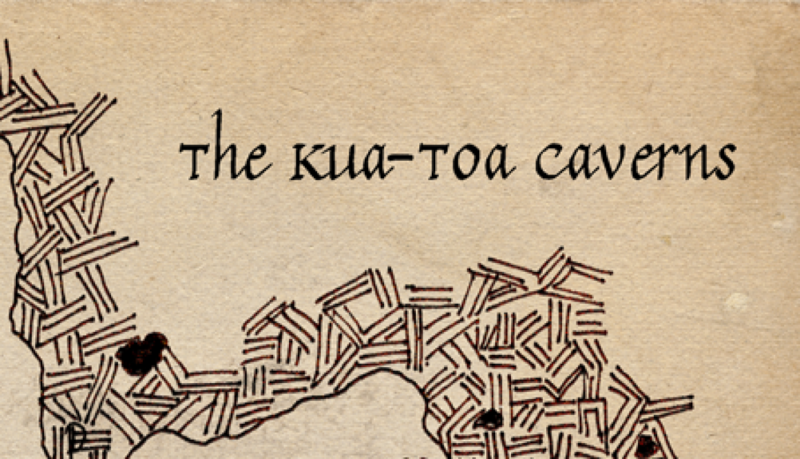 So, with very little prep I sketched out a rough map and populated it – with Kua-Toa, because they’re hideous and I’e always felt like they don’t get used enough. Obviously with two level 1 characters going up against them I had to scale them back in difficulty, but it allowed me to introduce them to the campaign very early on so that I can have some fun with them when the PCs are more able to face them – deep in the Underdark, at full power, rather than weakened and starving on the surface. If you like the look of the map, please feel free to download the higher-resolution versions. 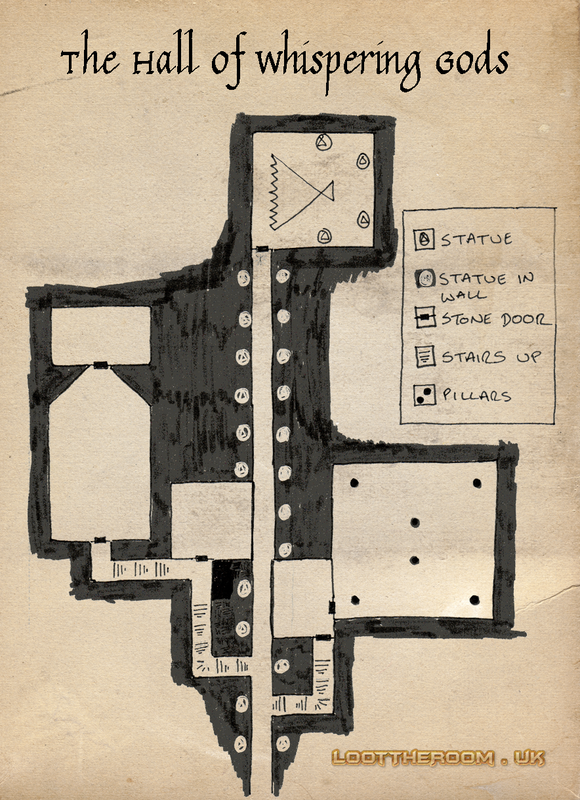 I’ve provided colour and black-and-white options, with and without grids, and a brief overview of how I used each room in the dungeon for this very specific encounter. Of course, you’re free to do whatever you want with it – and if you do use the map, I’d love to hear from you about it in the comments.